I stayed in unit 209 from 1/18/19 till 1/25/19. I have stayed in several units at this complex. I prefer 209. Not sure how many times I've stayed in that unit, 4 or 5 maybe. It is not a brand new place, but it is perfect for me. I am a single traveler, so perfect size. It is right on the beach, lanai basically hangs right over the sand, with the water 50 feet away. The place and grounds are super clean and comfortable, well maintained. The owners and managers just do a great job. This trip, the weather was perfect, lots of whales out int the channel, turtles all over the place. To be honest, if I could spend the rest of my days at this little condo, I would. What more can I say? I hate to give such good reviews, because the place becomes less available, more popular, the price goes up. It is still a great bargain on this beach. Thank you Chuck Buser for maintaining this great place. The location of the Napili Bay Resort is perfect for getting away from the crowds of Ka'anapali,and Lahaina, yet is just a short drive away when the urge hits to visit those areas. This studio condo is a corner unit on the top (second) floor of the complex and affords beautiful views of Napili Bay and beyond. You are just steps to the beach which can become crowded through the day but the nearness allows you to be lulled to sleep at night by the waves. The condo is well equipped for beach activities but a,little lacking in cooking condiments, so bring your own spices. The welcome tote bag with goodies was a very nice greeting upon our arrival. The Sea House and Gazebo restaurants are both within easy walking distance at either end of the beach for those times when eating in is not an option, although sunset meals on the lanai were amazing. Overall, a very nice condo with a perfect location on a lovely Maui bay. 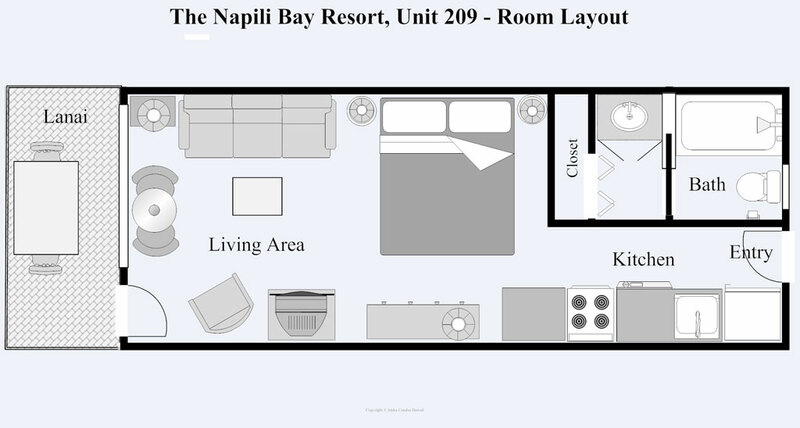 209 is an excellent unit with a perfect view of Napili Bay. The owners and local contact folks are awesome to work with and helped me extend my stay because I was having such a good time. The unit was also very clean and well equip. The reason this is a 4.5 and not a 5 star review is that the unit could be easily improved to 5 stars plus with some simple updates as some of the furnishings are dated and the bathroom (while although satisfactory) needs remodeled to be much more modern. If you are into the retro beach bungalow vibe then this place will be your jam. I am into modern design but that's just me. I would 100% stay there again and for the price I paid it was worth every penny.